It had to be a programming bug, or so researchers thought in 2002, when their computational models found an instability that distorts and drives a shock wave through an exploding star. But the phenomenon, which they called the standing accretion shock instability (SASI), kept showing up. Now, evidence appears to confirm the scenario that John Blondin, Anthony Mezzacappa and Christine DeMarino first described in a 2003 paper. The discovery may answer questions about how we, and everything around us, came into being. The clue is titanium-44, a radioactive isotope synthesized when atoms merge in core-collapse supernovae – the kind of exploding star the paper focused on. Titanium-44 is produced in the supernova’s interior, so its location in the remaining fragments provides hints to the blast’s evolution, says Mezzacappa, director of the Joint Institute for Computational Science at Oak Ridge National Laboratory and the University of Tennessee, Knoxville (UT). 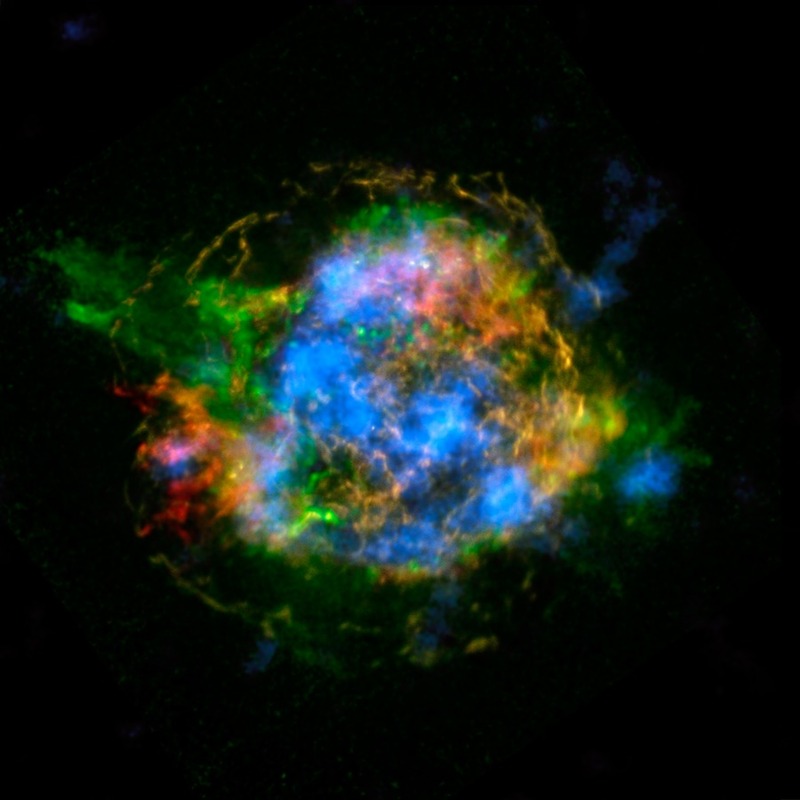 NASA’s recently launched Nuclear Spectroscopic Telescope Array (NuSTAR) satellite mapped titanium-44 in Cassiopeia A, the remains of a star whose explosive death was sighted around 1671. The space telescope captured high-energy X-rays that emanate as titanium-44 decays into scandium-44 and then calcium-44. Models that include things like the SASI best explain NuSTAR’s observations, researchers reported in a recent issue of the journal Nature. Core-collapse supernovae are explosions of massive stars several times the sun’s size. Over millions of years, tremendous pressure and heat fuse atoms inside these stars into layers of elements, with iron, the heaviest, at the core. The iron core eventually gets so heavy it collapses. Like a rubber ball that’s squeezed and released, the core rebounds, sending out a shock wave that blasts most of the star material into space. The remaining core becomes a neutron star, comprised of matter so dense that a sugar-cube size chunk would weigh about 100 million tons on Earth. Physicists say core-collapse supernovae supply the bulk of the universe’s light elements and many of its heavier ones. Star rubble eventually comprises everything we see around us. Early on, researchers found a twist: Matter falling into the core counteracts the rebound shock’s momentum, stalling it for as much as 300 milliseconds – an eternity, considering that the star collapses in about a tenth of a second and rebounds in about a second. Astrophysicists weren’t sure what restarted the shock to ultimately power the explosion. They knew huge numbers of neutrinos – nearly massless particles that constantly pass through us with little effect – played a role. Neutrino heating helped restart the shock, but that process couldn’t do it alone in spherically symmetric models, in which the shock moves out in all directions. Researchers theorized that convection – circulation that pulls neutrinos out of the core and to the surface where they can more easily radiate – distorted and restarted the shock. In the early 2000s, Blondin says, he and Mezzacappa “jumped into it because in looking at those results, we really didn’t buy” that assertion. As part of a summer research project, DeMarino and another NCSU undergraduate started building a two-dimensional supernova simulation using the Virginia Hydrodynamics (VH 1) code Blondin had helped create. Hydrodynamics codes portray the physics of moving fluids – in the case of supernovae, gases and particles.